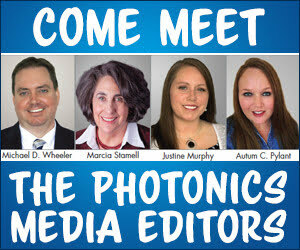 Come meet the Photonics Media editors! Ask how you can get a free t-shirt! Proven Quality Optoelectronic Product Canon U.S.A. Inc., Sub. of Canon Inc., Industrial Products Div. Compact Hybrid Scanning System nPoint Inc.
CW Single-Frequency DPSS Lasers UniKLasers Ltd.
Rotators, Isolators & Detectors Electro-Optics Technology Inc. Custom Diamond-Turned Optics Diverse Optics Inc.
Specim IQ Specim, Spectral Imaging Ltd.
PolSNAPTM Compact Stokes Polarimeter Hinds Instruments Inc.
Polarization Imaging Hinds Instruments Inc.
Nanopositioning & Precision Motion Mad City Labs Inc.
2-3 µ Life-Sciences Laser Module Power Technology Inc.
Fiberguide's RARe Motheye Fiber Fiberguide Industries Inc., A Halma Group Co.
Resolv4K Lens System Navitar Inc.
Smooth-Surfaced & Freeform Optics Fresnel Technologies Inc. Optics for High Power Optimax Systems Inc. HEAR - DLC Coatings On IR Materials Applied Optics Center (AOC), Div. of Optex Systems Inc.
1919-R High Performance Optical Power Meter Newport Corporation, Sub. of MKS Instruments Inc.
WinCamD-IR-BB MWIR/FIR Beam Profiler DataRay Inc. Objective Lenses from OptoSigma OptoSigma Corp., Sub. of Sigma Koki Co. Ltd.
New Wavelengths for Raman Cobolt AB, A HUBNER Group Co. Powerful Femtosecond Fiber Lasers TOPTICA Photonics Inc.
NTKJ's Fluoropolymer Lenses RHK Japan Inc.
PixelCam Multispectral Cameras Ocean Optics Inc., A Halma Group Co. Customized OEM Optical Systems Prior Scientific Inc., Sub. of Prior Scientific Instruments Ltd.
Microstage Has Controller Inside New Scale Technologies Inc.
1920 x 1152 Phase SLM - Speeds up to 714 Hz Meadowlark Optics Inc.
Wavelength Meters – High Accuracy Bristol Instruments Inc.
Quick Turn Prototypes OPCO Laboratory Inc. Precision Motion, Smaller Products New Scale Technologies Inc.
High-Resolution Spectrum Analyzer Bristol Instruments Inc.
New SiPMs Cover UV to NIR Hamamatsu Corporation, Sub. of Hamamatsu Photonics K.K. Phase Noise/Linewidth Analyzer System OEwaves Inc.
Wavemeters for Unrivaled Precision TOPTICA Photonics Inc.
New Chameleon Discovery Advances Brain Imaging Coherent Inc.
6th Annual Congress on Dentistry and Dental MedicineDentistry Medicine 2018 provides the opportunity to evaluate emerging technologies and recent updates in oral health care across the globe.